Look for an interview with Janet in the Fall 2012 Early Music America magazine. 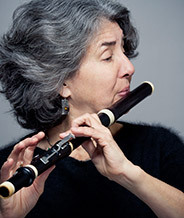 Janet See is one of today’s outstanding performers on baroque and classical flute. For over 30 years she has performed as a soloist, in chamber music, and in orchestras throughout North America and Europe. In London, where Janet lived for 12 years, she played principal flute for Sir John Eliot Gardiner’s two orchestras, and with those groups recorded the complete Mozart Operas and Beethoven Symphonies as well as numerous other discs. While in London she also played principal flute for 'The Taverner Players', conducted by Andrew Parrott. In North America Janet plays principal flute with Philharmonia Baroque under Nicholas McGegan and has recorded Vivaldi and Mozart Concertos with that orchestra. She also performs frequently with the Portland Baroque Orchestra and as guest soloist with chamber music ensembles throughout the US and Canada. Among her highly acclaimed recordings are the Vivaldi Concertos and the complete Bach Flute Sonatas, both recorded on the Harmonia Mundi label. Other labels she has recorded on include DG Archive, EMI, Erato, Hyperion and Phantom Partner. Janet is on the Early Music Faculty at Cornish College of the Arts in Seattle and is an active and enthusiastic teacher of early flutes and also of interpreting the nuance and language of baroque and classical music on modern flute. She received her degree on the modern flute at Oberlin Conservatory, training with Robert Willoughby. Her post-graduate training was with Frans Vester in The Hague. Janet is a qualified teacher of the F.M. Alexander Technique, having trained in London with Walter Carrington. She currently lives on Bainbridge Island, Washington with her husband and son.